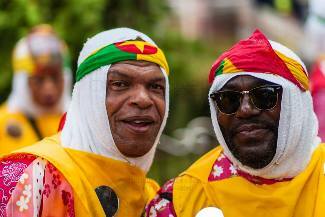 First it was one truck and one band to do a portrayal from and about Grenada, and then it became two, but in the end only one Grenadian band made it down Eastern Parkway for last week Monday’s annual Labour Day parade in Brooklyn, New York. By 3:30pm, Grenadians at home viewing the parade as well as those at the venue learnt that the “Greenz United Spice Truck” would not be on parade on Eastern Parkway. The reason given was “failing the inspection”, but it’s the view of some that the denial was an act of sabotage, while others have accepted the fact that the truck failed to pass all the requirements for the road. 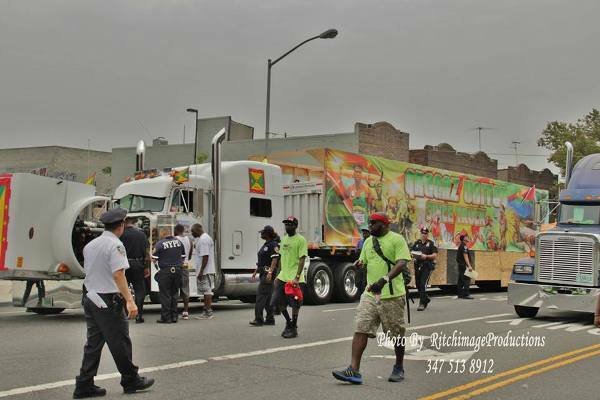 “The truck for the costume band failed law enforcement inspection” said Eric Gibbs, chairman of the West Indian American Day Carnival Association Inc who explained that the failure was link to tires and brakes. “We have no say in who fail or pass inspection. This is entirely out of our hands. It’s the police who give the authority for trucks to be on the route after they are inspected, so when the truck did not get approval there is nothing we can do,” said Gibbs who witnessed the inspection. “It was not only the Grenada truck which failed, but the Marley Truck which was to represent Jamaica also failed the inspection. There were trucks which had other problems, but once it was fixed and the police gave the approval, they were allowed on the Parkway,” Gibbs said. Dave Louison, the Band leader of Greenz United who is in his third year of putting out a band, said that he also believes that the denial was linked to a number of debatable activities preceding the Labour Day Parade. “Among the things which occurred were visits from the police to our mas’ camp claiming that persons had made reports of excess noise and the shutting down of our music way before the allotted time. There is a shutdown of time 11:00 pm but we were made to stop the music at minutes to ten. Things happened along the way and it all climaxed on Labour Day,” he said. Officials at the WIADCA said that they have also heard talk about the sabotage and just could not understand why persons associated with the band will believe that others will engage in such act. “Yes, we organised the activity but we are in no way responsible for giving approval for the road. The band leaders are aware of the requirement and they know that safety on the road is very important,” Gibbs said. One person who claims to be associated with the Greenz United band said that following the inspection, they encountered all kinds of problems including a change in time for the final inspection. “That is why I believe this was an act to sabotage against us,” said Facebook user Ritchmage Francis, whose timeline contains pictures of the truck being inspected by NYPD. “The picture there tells a story, and I want people to see and understand the story,” he added. The other Grenadian band which paraded was Val Adams and Friends who portrayed “Shortknee 500 Strong.” Though having 85 masqueraders it was able to win the Adult Small Band category. Adams said that initially, both the costume and the short knee bands had to use one truck, but as the parade day drew closer there were persons in the costume band who had concerns about the impact of the powder on the costumes. “A compromise was unable to be reached and by the Thursday before the parade it was clear that we will be on our own; on Friday I did all the paper work to ensure we paraded on Labor Day,” said Adams.